The main character of the game, Kyle is very much like his father, Stahn; Kyle's straightforward, simplistic personality is similar to Stahn's as well. However, Kyle remembers little of his father, as the famous hero left on a journey when Kyle was very young; this is what Kyle has been told by Rutee, his mother, and Loni, his closest friend. In actuality, Stahn was killed by Barbatos when Kyle was a child. Rutee runs the Dunamis Orphanage based in the town of Cresta, so the other children there are akin to family. Kyle is especially close to Loni, who treats him like a little brother; their relationship has been forged over more than ten years. 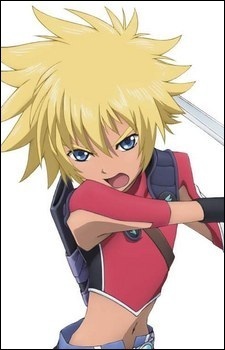 Kyle has absolute faith that he will become a hero someday due to the heroic bloodline of his parents; Stahn and Rutee were members of the group (in the original Tales of Destiny) that dealt with the dangerous Eye of Atamoni some eighteen years prior to the initial events of Tales of Destiny 2. In battle, Kyle is a powerful physical attacker who uses swords, and his magic is relatively weak and underdeveloped; these traits form yet another parallel with Stahn.